Spent two days at the RCA in London. A good opportunity to have some time to discuss with James Auger, Anthony Dunne and their class, give a talk to them and explore the "Impact!" exhibition. This exhibition is another highly interesting example of interdisciplinary collaborations between design and scientific research, as already discussed about this other project. 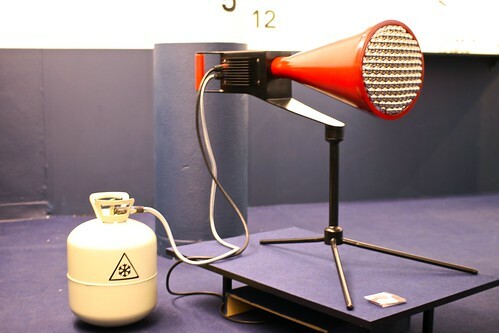 As described on the web platform, 16 researchers have collaborated with designers from the RCA under the coordination of the Engineering and Physical Sciences Research Council (EPSRC). Designers worked with them to produce conceptual designs (videos, photographs, interactives, prototypes, props and system diagrams and illustrations). "Design can shift discussions about the impact of science on our daily lives away from abstract generalities to concrete examples grounded in our experience as members of a consumer society. It can facilitate debate about different technological futures before they happen, create dialogues between different publics and the experts who defines the policies and regulations that will shape the future of technology, and help ensure that we pursue the most desirable, and avoid the least desirable. The design projects in this exhibition offer an alternative view of how science could influence our future. The purpose is not to offer prediction but inspire debate about the human consequences of different technological futures, both positive and negative. There are no solutions here, or even answers; just questions, ideas and possibilities. They probe our beliefs and values, they challenge our assumptions, and they help us see that the way things are now is just one possibility - and not necessarily the best one." Some projects were more revealing to me than others, I guess my choice reflects a personal choice rather than a judgement on their quality. Perhaps the most inspiring to me is the one called "Happylife" by James Auger and 3 other scientists. 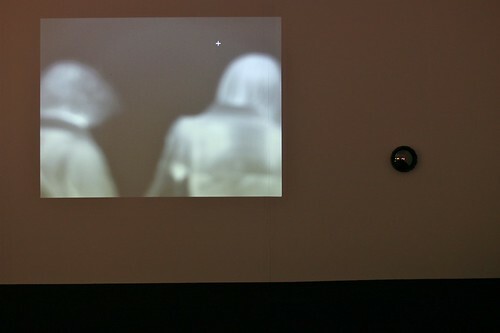 It basically explore the uses thermal imaging to analyse emotional states in a domestic context. This technology embedded in a HAL9000-like eye of Sauron can detect heat signatures (as shown on a video on the left on the picture below). Doing this, the system assesses a person’s physiological state and turn the changes into movements/dials on a family dashboard (with barometer-like displays). This project questions how imperceptible body parameters could reveal emotions such as guilt. What is highly intriguing (and smart according to me) is that the dashboard does not have any label... leaving its interpretation to the people who will live with it. How would this change social interactions in the family home? Would this electronic device enable family members to infer new things about their relatives? Would the device detect patterns invisible to people? All these issues are suggested by beautiful vignettes that I did not capture with my camera. "The potential for this to go much further with the application of face recognition, thermal imaging and expression monitoring is obvious. The design challenge here is to explore how this might happen. How might products and services react to humans if they were aware of their mood." Another project I enjoyed as the one called "The 5th dimensional camera" by Anab Jain, Jon Arden and three other researchers. 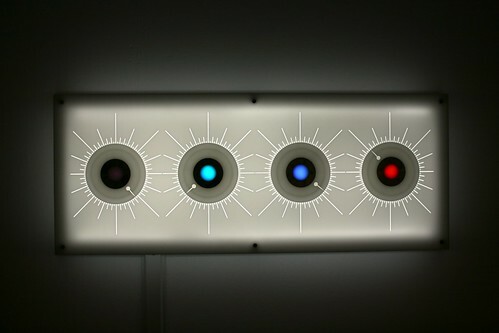 It explores the notion of quantum mechanics and the possibility to access multiple dimensions. 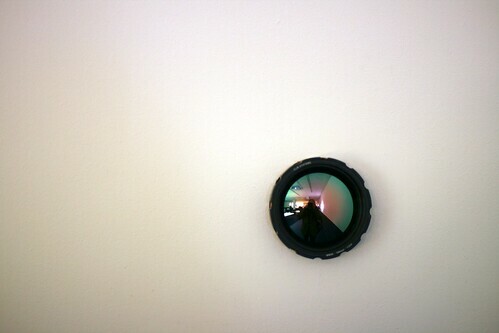 The project consists in a fictional camera that can capture "glimpses of 450 parallel universes suggested by quantum physics". By presenting such images, the two designers aimed at highlighting the "the strange processes at work within quantum computation to the wider public, and explore how they might impact our beliefs, our values and indeed our fabric of reality". To understand more the implications of such potential, the exhibit featured different narratives of test subjects who employs the camera in their own different ways. Why do I blog this? these are quick and selective notes about the exhibit to keep a trace of what echoed with my interests. The two projects I mentioned as well as Anthony Dunne's framing are relevant IMHO in terms of how design research can operate and what sort of artifacts could be designed in such context. We're close to the idea of design fiction here. People interested in this can also look at other write-ups by Richard Banks or building_space_with_words.